Should peacekeepers be withdrawn from ‎Sinai? The army added that two of its soldiers were killed during the operation. A comprehensive military operation against Islamist militants, "Martyr's Right", was launched at dawn on Monday in the towns of Rafah, Arish, and Sheikh Zuweid in the northern part of the peninsula, the military said. North Sinai, adjoining Israel and the Palestinian Gaza Strip, is a stronghold of Islamist militant group Ansar Beit Al-Maqdis, an Egyptian affiliate of the Islamic State group that has intensified their attacks against army and police personnel since the 2013 ouster of Islamist president Mohamed Morsi. "Army troops along with anti-terror police units attacked hideouts of Islamist militants, killing 29 terrorists and destroying vehicles and equipment used by the [terrorists] in criminal operations," in an audio statement by the Egyptian military spokesman, Mohamed Samir, on national TV. During the offensive, two army personnel--a soldier and a conscript--were killed and four others were wounded when a bomb struck their armoured vehicle, the statement added. It also said troops have beefed up security around major government installations and private buildings in the restive region as well as in roads leading to them. The Egyptian military began an intensive security sweep in the region in August 2012 after an attack near the border with Israel and Gaza that killed 16 Egyptian soldiers, the deadliest internal attack on Egyptian troops in recent years at the time. Troops have since been fighting the Islamist insurgency that has left hundreds of army and police personnel in Sinai and across the country. 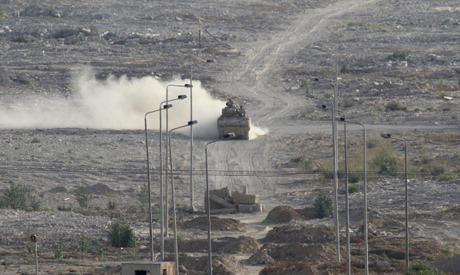 Last July, in one of the bloodiest attacks on the army by Islamist militants in years, 21 soldiers were killed during simultaneous assaults on army checkpoints in the North Sinai towns of Sheikh Zuweid and Rafah. The army launched a massive counter-attack using air strikes to repel the militants, announcing it killed tens of insurgents.